The Visigoths (Western Goths) were one of two main branches of the Goths, an East Germanic tribe (the Ostrogoths were the other). Both were among the loosely-defined Germanic tribes that fought the Roman Empire during the Migration Period. 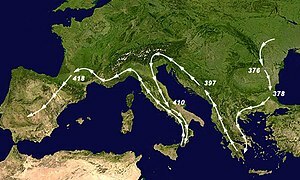 Most famously, a Visigothic force, led by King Alaric I, succeeded in storming Rome in 410 AD. Later Visigothic kings ruled southern Gaul, and Hispania after they had taken it from the Alans and the Vandals. After the collapse of the Western Roman Empire, the Visigoths played a major role in Western Europe for another 250 years and adopted Roman culture and clothing. This page was last changed on 25 January 2019, at 04:01.